About the Author: Dr. Anthony Dailley is received his dental degree from the University of the Pacific School of Dentistry. Dr. Dailley is a practicing dentist specializing in bad breath solutions and halitosis products. He also works with his patients offering products for dry mouth and teeth whitening products. I'm reading: Complete Your Home Dental Care with Hydro Floss Oral IrrigatorTweet this! It is a good product based on dental product review. Helps fight plaque buildup by cleaning our the parts where floss can't reach it. 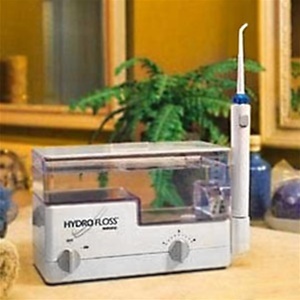 I've seen a hydro floss irrigator at my dentist Beverly Hills clinic and it felt good when he used it with my teeth. You can really feel how clean every corner of teeth are after the process. My Bartlett dentist uses this every time I have a cleaning appointment. It's good to have this at home too for superior teeth cleaning and oral hygiene. My dentist in Huntersville has told me about this technology and how effective it is to prevent and cure periodontal disease. Hence, it is still best to consult a dentist first before trying this treatment to avoid complications. This is awesome! I need to ask my dentist in rockford il about this new technology. I love how the stream cleans in between the teeth, on the surface and under the gums to areas where brushing and flossing don’t reach. Floss is really helpful especially when you do not have very nice teeth placement. My Dentist in Edgecliff advised me to bring floss in my bag all the time. I'll be sure to keep this in mind since we all know that it's very important to take care of your teeth. You are so interesting! I don't think I've read something like this before. So nice to discover someone with some unique thoughts on this topic. Really.. many thanks for starting this up. This web site is something that is required on the web, someone with some originality!! Magnets in the handle? Utter and complete nonsense. A cheaply made knock off of a water pik. I have more to say, but will hold off saying more unless I am refused a refund. There conjointly exist instances within which folks solely visit the medical practitioner as a final resort. instead of going for normal dental check-ups, they solely visit the medical practitioner once full of specific dental problems, for more information click here dentist brewster. Phenomenal article. Exceptionally intriguing to peruse. I truly love to peruse such a pleasant article. Much appreciated! continue shaking. I love the thing. My teeth have never been cleaner. They feel much cleaner after using the Hydroflosser. And, when I go for my 6 month cleaning and check up, my dental Hygienist has a much easier job of removing the plaque since there is so much less now. Dental discount plans have very friendly staff. Never overly pushy with additional treatments. One of the nicest dental office I have ever had. Highly recommend this office. I love the thing. My teeth have never been cleaner. They feel much cleaner after using the Hydroflosser. And, when I go for my 6 month cleaning and check up, my dental Hygenist has a much easier job of removing the plaque since there is so much less now.